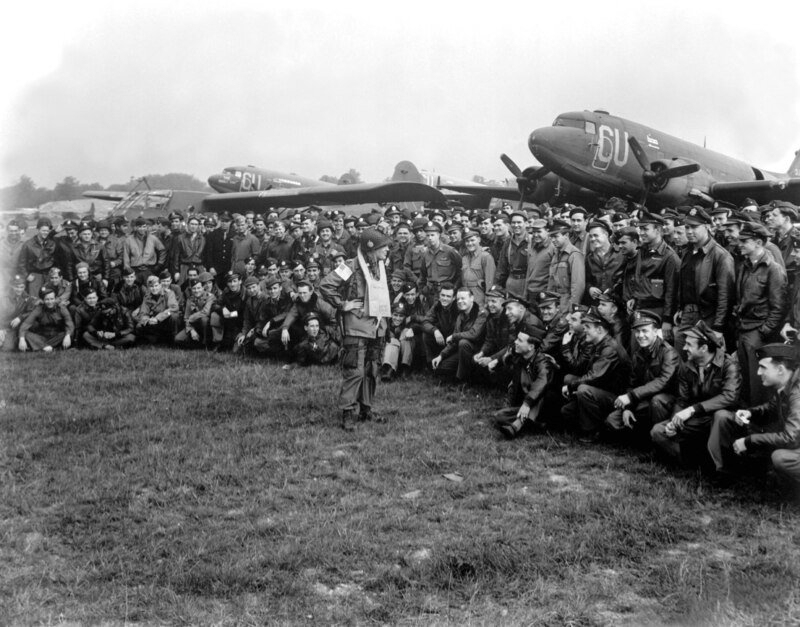 Brigadier-General Anthony C. McAuliffe, artillery commander of the 101st Airborne Division, gives pilots last-minute instructions in England for Operation Market Garden on Sept.18, 1944. McAuliffe would go on to lead U.S. forces in the Ardennes. Or close the wall up with our English dead. . . .
That you are worth your breeding. The briefest, if not the greatest, wartime speech ever was not really a speech at all. It was a one-word message written in December 1944 during the Battle of the Bulge, one of the last German offensives of the Second World War. Weather was preventing resupply drops. United States paratroopers were cold, hungry and starved for ammunition when Brigadier-General Anthony McAuliffe, acting commander of the 101st Airborne at Bastogne, Belgium, received surrender terms from his German counterpart. Not for a German surrender, mind you, but his own. He gave the American two hours to decide. 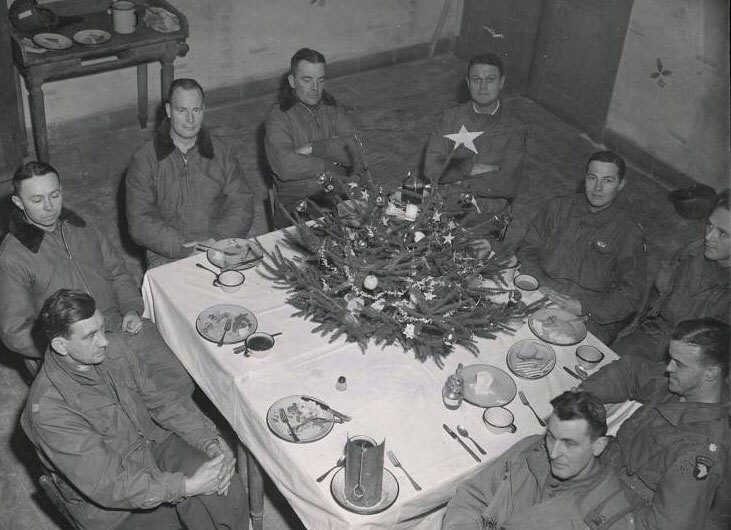 Brigadier-General Anthony McAuliffe and his staff celebrate Christmas in Bastogne, Belgium, on Dec. 25, 1944. But McAuliffe’s note was a message to his American troops as much as to his German counterpart. And since the general could not deliver it to all of them himself, he relied on word of mouth to convey it among the U.S. rank-and-file scattered through the forests and hills of the wintery Ardennes. The reply filtered along the lines, all right, lifting spirits and fortifying resolve in the face of the anticipated withering artillery barrage. As it turned out, the barrage never happened: the German heavy guns having already been moved elsewhere and Bayerlein’s higher-ups having ordered the intended infantry to another objective. The lack of follow-up by the Germans in the face of McAuliffe’s simple and simply stubborn response only reinforced “nuts” as a watchword and a rallying cry to the beleaguered Americans. It was one for the ages. By Christmas, the skies had cleared, supplies were dropped and reinforcements followed. The day had been saved and the Allied advance on Berlin could resume. Spanning millennia, wartime speeches big and small have inspired and motivated armies, and entire nations. Winston Churchill’s “blood, toil, tears, and sweat” speech of May 13, 1940, his first as Britain’s prime minister, set the tone for his inspired leadership as he succeeded Neville Chamberlain’s declaration of “peace in our time” with a call to war. “We are in the preliminary stage of one of the greatest battles in history,” he told Parliament. “I would say to the House as I said to those who have joined this government: I have nothing to offer but blood, toil, tears and sweat. “We have before us an ordeal of the most grievous kind. We have before us many, many long months of struggle and of suffering. You ask, what is our policy? I will say: It is to wage war, by sea, land and air, with all our might and with all the strength that God can give us; to wage war against a monstrous tyranny, never surpassed in the dark and lamentable catalogue of human crime. That is our policy. Indeed, Churchill was quite familiar with Garibaldi. He had once considered writing his biography. And Garibaldi faced circumstances at the time of his original speech not unlike those of 1940s Britain, with his troops turning for a hazardous mountain escape in the face of a closing superior army. Put in the right context, desperation can be a great motivator. During the Second Punic War in 218 BC, Hannibal led his Carthaginian army across the Alps, thus bypassing Roman forces and taking the war directly to the Roman Republic. It is considered one of the greatest military feats of the ancient world but, upon their descent into Italy’s Po Valley, they found themselves in a tight spot. If he had any doubts, Hannibal was not going to impart them to his troops. Instead, he simply told it like it was and gave them no option but to defeat their enemy. “On the right and left two seas enclose you, without your possessing even a single ship for escape,” Hannibal said. “The River Po around you; the Alps behind…hem you in. His army went on to defeat the Romans at Ticinus, the Trebia and Lake Trasimene. They took Cannae, then routed the Roman army near Apulia before he was forced to bypass Rome due to a lack of reinforcements and materiel from Carthage. Many parts of Italy subsequently joined Hannibal’s cause but, with Carthage lacking the political will to support him, the war settled into a stalemate that eventually forced the great general to withdraw, having achieved unprecedented success and solidifying his place in history, but ultimately failing to close the deal. Paul Triquet leaves Buckingham Palace after receiving a Victoria Cross from King George VI. In December 1943, Canadian Captain Paul Triquet was leading what was left of his company of the Royal 22nd Regiment across a gully in an attempt to take the strategic Casa Berardi as Allied troops drove German forces out of Italy. It seemed like a long shot. With that, he dashed forward and his men followed. They gained ground, held out and with the help of Canadian tanks, they eventually took it. 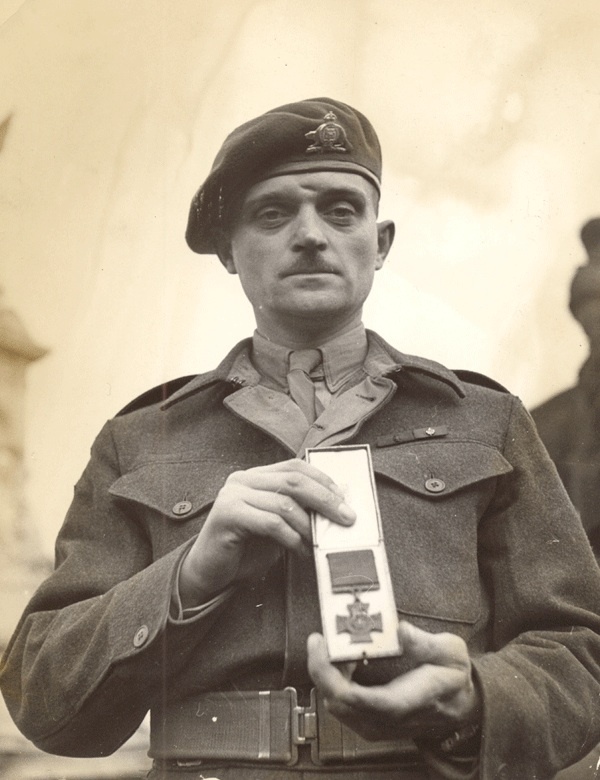 Triquet was awarded the Victoria Cross. The Soviet Union stood alone in the east in 1941 defending against the Nazi juggernaut. It was July, and the German invasion was already thundering across the steppe. Before Stalingard, before the Red Army turned the tide and pushed the cold and starving Germans back to Berlin, Premier Josef Stalin, still known as the beloved Uncle Joe, appealed to “his” people by painting a graphic, unvarnished picture of what was at stake. “The issue is one of life or death for the Soviet State, for the peoples of the USSR,” he said. “The issue is whether the peoples of the Soviet Union shall remain free or fall into slavery…. There must be no room in our ranks for whimperers and cowards, for panic-mongers and deserters. Knowing what we know now of Stalin’s brutal regime—he is said to have killed 20 million of his own people and dispatched thousands more to Siberian work camps—his references to enslavement and freedom may ring somewhat hollow, but there is no doubt the cause was just and the execution nothing short of heroic. Many historians and nearly two-thirds of 168 respondents to a Legion Magazine poll said the Soviet Union contributed more to the Allied victory in Europe than any other nation. And with good reason: Up to 30 million Soviets—soldiers and civilians—died during the Second World War, while the number of German troops killed by Soviets is estimated at more than 3.5 million—three-quarters of the total 4.7 million German military who died by Allied hands. Forty-six years later, U.S. President Ronald Reagan would call for the dissolution of the Communist state and its satellites and, by implication, the Cold War, in a speech directed not at any army, but at the USSR’s last leader, Mikhail Gorbachev. “There is one sign the Soviets can make that would be unmistakable, that would advance dramatically the cause of freedom and peace,” Reagan said at the Berlin Wall on June 12, 1987. The wall would fall on Nov. 9, 1989. The Soviet Union collapsed in December 1991. Despite many proxy wars over its lifetime, the bulk of the shots fired in its demise were verbal. A speech by Queen Elizabeth I in July 1588, as the Spanish Armada crossed the North Sea bound for England’s shores, is hard to beat. She was visiting troops at Tillbury, along the Thames River east of London. One of her chaplains, Lionel Sharp, wrote it down. “I am come amongst you…being resolved, in the midst and heat of the battle, to live and die amongst you all; to lay down for my God, and for my kingdom, and my people, my honour and my blood, even in the dust,” she said. The armada was defeated and what had until then been tenuous support for Elizabeth’s reign was secured. American generals are notoriously great motivators. 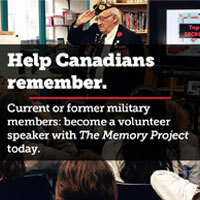 Canadian troops fighting in Afghanistan saw it first-hand in addresses by 101st Airborne generals at Kandahar. Great oratory is a U.S. military tradition that dates to the Revolutionary War. In the spring of 1944, General George S. Patton spoke to his 3rd Army as it advanced across Europe. His oratory was simple, direct, but great nonetheless. “I don’t want to get any messages saying, ‘I am holding my position,’” said the brassy, outspoken Patton. “We are not holding a goddamned thing. Let the Germans do that.